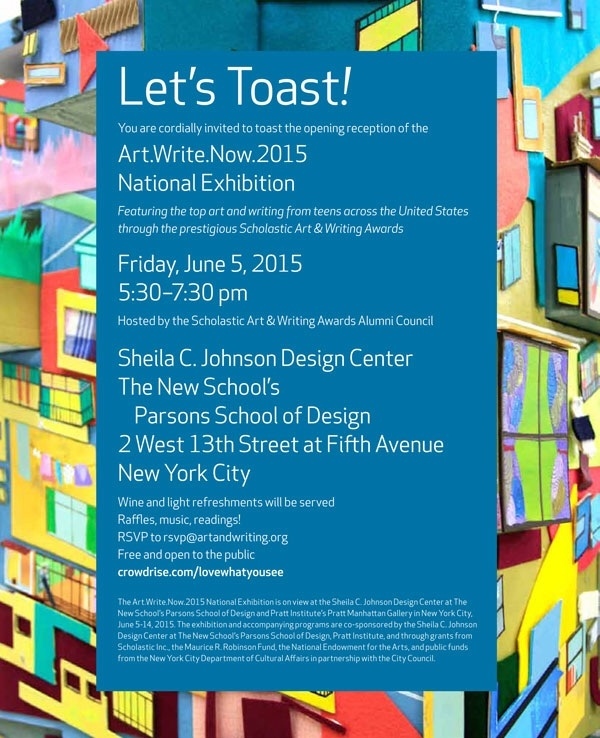 I would like to invite all of you to the opening reception of the Art.Write.Now.2015 National Exhibition on Friday June 5th from 530-730PM. Please feel free to share this post with your friends and family. It was an absolute pleasure to serve as a National Portfolio Judge for this year's Scholastic Art and Writing Awards. I was incredibly impressed with the quality of work submitted by this new generation of creative thinkers. I am also honored to be part of the Scholastic Art & Writing Alumni Council which will be hosting the Event. Thank you Jeanette Anderson for spearheading this project. The event will be held at Sheila C. Johnson Design Center located at 2 W 13th Street at Fifth Avenue NYC. Wine and Light Refreshments will be served.